Hutchinson, Kan. (June 30, 1957) – A Kansan, Lennie Funk, took top money, $590, in the Jayhawk 300 new model car race at the Kansas State Fairgrounds half-mile oval on Sunday afternoon. A battle between two top drivers was shaping up for the IMCA-sanctioned event. 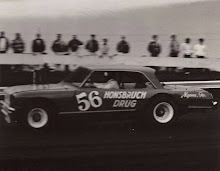 Among the entries in the 300-lap new car race were Johnny Beauchamp of Harlan, Iowa, the defending IMCA national champion, and Bob Burdick, the current point leader from Omaha, Neb. 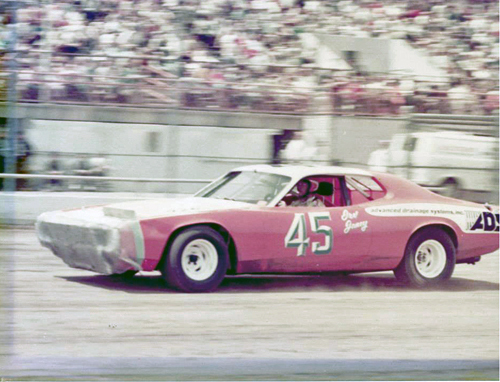 Burdick had whipped the national champion four times in races that year. 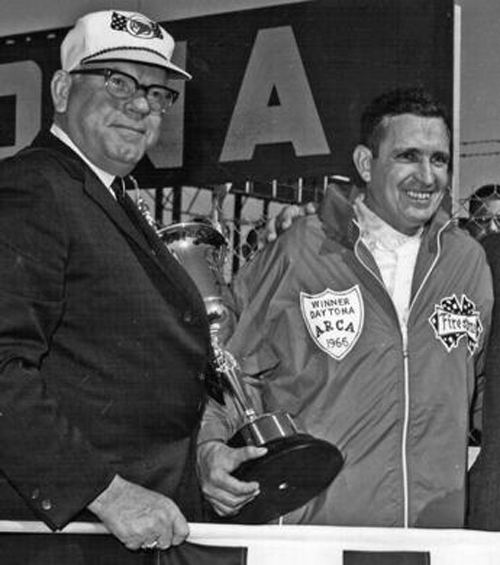 The race was a split feature of 300 laps. Cars ran time trials and started in regular order with the fastest cars leading the pack. After 150 laps have been covered, a first-half winner will be declared and the cars pulled into the pit area. After realignment with the slower cars to the front, the second 150 laps were run. No work could be done on the cars while they were in the pits awaiting realignment. 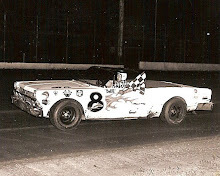 Funk, from Otis, drove a 1957 Chevrolet to third place in the first 75-mile grind and finished second in the second half. Prize money was awarded on the basis of the best placing in the two races. 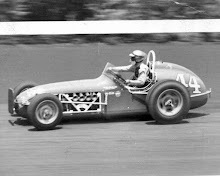 Bob Burdick, Omaha, Neb., drove a 1957 Ford to second best in the overall standings. He won $510 by placing first in the first half and fifth in the second. Over 3,500 race fans witnessed the race; the longest ever run in Kansas and one offering the richest purse. The race was sponsored by the International Motor Contest Association. Two minor accidents marred the day. Don White, Keokuk, Iowa, cracked into the south fence on lap 102 of the second half portion of the feature. He was not injured. Burdick broke an axle on the 120 lap of the second but still managed to finish fifth. The big match-up between Beauchamp and Burdick never materialized. While Burdick experienced success in the marathon event, Beauchamp blew his engine in hot laps and was unable to make repairs and even compete. 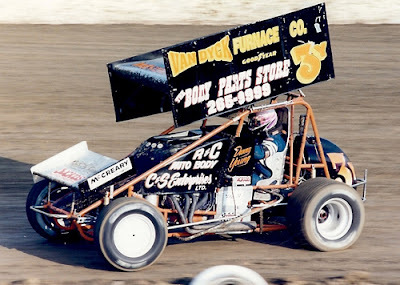 Burlington, Iowa (June 27-28, 1994) - Danny Young wanted to run both classes at the USA Sprint Car Nationals at 34 Raceway. That meant he would only dominate one class. The Des Moines driver established himself as the favorite in the limited sprints class, having the fastest time in qualifying and winning the Fast Car Dash in the first night of the two-day event Monday on the 3/8-mile dirt oval. Young also wanted to drive in the unlimited sprints, but track officials refused his request. "They told me I had to have two cars," he said. He took the one car he had and ran a fast time of 14.59 seconds in qualifying. That put him in the sixth position in the six-car Fast Car Dash, but he had the lead in the 10-lap race before the field came out of the second turn on the first lap. "He is a very aggressive driver," said Bart Schneiderman of Burlington, who will start outside of Young in the first row of tonight's 25-lap feature. "I knew he would be right on me in the first lap." "I didn't come here to finish second," Young said. Young has won 10 features this season. "When we've raced, the car has run well," he said. "But we've had some bad luck. We broke a rear end twice last weekend." What will it take to beat Young? “A miracle, maybe," Schneiderman said. "The car will be ready, I'll be ready, and the crew will be ready. But (Young) is awful strong." Randy Wagler of Danville and Jeff Haines of Oskaloosa will start in the second row. Steve Wares of Knoxville and Scott Whitworth of Worthington, Mo., will be in the third row. The 30-lap unlimited sprints feature has several favorites. Gary Wright o Hooks, Tex., had the fast lap of 13.49 seconds in qualifying. Johnny Herrera of Albuquerque, N.M. won the Fast Car Dash. Danny Lasoski of Dover, Mo. - who won of the features at the World of Outlaw's Valvoline Classic at Knoxville Raceway on Saturday - had the third fastest time and finished second behind Herrera in the Fast Car Dash. "It'll be a great show," Herrera said. "It could be between Danny and me, but Gary was strong in qualifying and other drivers could sneak in." Herrera and Lasoski will start on the front row. Randy Smith of Mount Ayr will start with Burlington's Todd Taeger in the second row. Wright and Terry McCarl will start on the third row. "It was like 'follow the leader' (in the Fast Car Dash) because the way the track changed,"
Herrera said. "My car ran well. If the track is the same tomorrow night, we won't change much." On Tuesday night, Danny Young was perfect…and Gary Wright was almost perfect. The two drivers took feature wins on the final night of the USA Sprint Car Nationals Tuesday at 34 Raceway. Young won the $1,000 top prize for winning the limited sprints feature, while Wright won $5,000 for taking the unlimited sprints feature. Young won all of the honors in the two-day event on the 3/8-mile dirt oval. He had the fastest car in time trials and also won the Fast Car Dash Monday, then came back to lead all 25 laps of Tuesday's feature. Young's car was so perfect not even an incident on the seventh lap could disturb its rhythm. Young went in to the first turn too low, striking a tire marker embedded at the bottom of the turn. But the Des Moines driver kept the lead. "I was looking for a groove with a little moisture, but I went too low," Young said. "But the car didn't even bobble. The car ran well all night." Young started from the pole and was lapping cars by the fifth lap. "I didn't think we would be lapping cars that fast," said Bart Schneiderman of Burlington, who finished second. "When we got into lapped cars, I think he had the advantage." Young sailed through the slower cars by using several grooves. "It could run just about anywhere," Young said. Schneiderman, who chased Young through the Fast Car Dash, stayed close because of four caution periods. "I was hoping I could use the restarts to get a better jump on him," Schneiderman said. "My car was good, except it was a little loose. I was tickled to finish second." It was Young's 11th feature of the season. Butch Nutaut of Springfield, Ill., finished third. Jeff Haines of Oskaloosa was fourth. Wright also had the fastest car in time trials, but a different set-up hurt him in the Fast Car Dash. He finished fifth in the six-car field. "We tried a different set-up as kind of experiment last night and it really hurt the car," the Hooks, Tex., driver said. "We just threw everything out and went back to the original setup." Wright started fifth in the field and trailed early as Johnny Herrera and Danny Lasoski controlled the first 20 laps. Herrera, who started from the pole, led the first 16 laps before Lasoski led laps 17 through 19. Wright then took the lead and held on for his 10th feature win of the season. "We had the right tires and the right gear," Wright said. "It was tough getting through lapped traffic, but the car ran well." Herrera held off Lasoski for second. Terry McCarl was fourth. Aron Berryhill was fifth. 3. 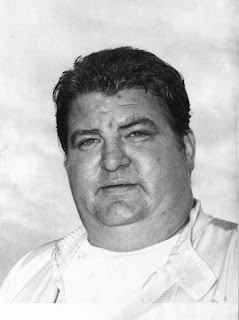 Butch Nutaut, Springfield, Ill.
6. Wayne Sternbaugh, El Paso, Ill.
15. Randy Plath, Stronghurst, Ill.
1. Gary Wright, Hooks, Tex. 3. Danny Lasoski, Dover, Mo. 5. Aaron Berryhill, Tulsa, Okla.
6. Jimmy Carr, Maple Ridge, B.C. 8. Todd Taeger, Springfield, Ill.
12. Dale Peterson, Brookfield, Wis.
14. Marlow Jones, Sioux Falls, S.D. 19. 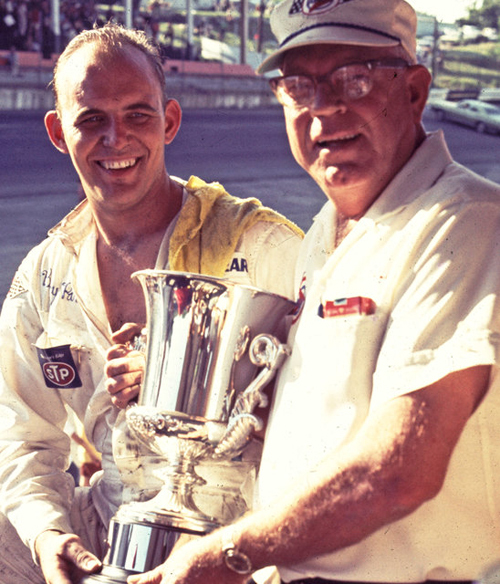 Manny Rockhold, Pekin, Ill.
West Liberty, Iowa (June 23, 1977) - Many names have come and gone over the years on the stock car racing circuit at the West Liberty Fairgrounds racetrack. 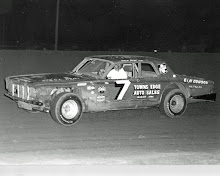 But the one name which has-stood the test of time best is that of Johnny Moss of Iowa City, who is in his 21st year behind the wheel of a stock car. 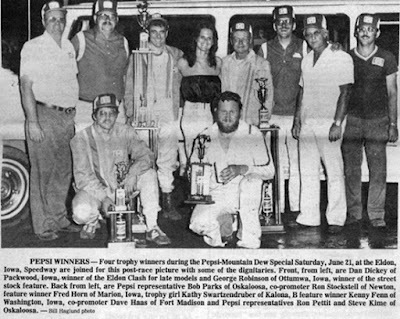 There may be other drivers around the 20-year mark, but Moss has been racing every year at West Liberty and tracks in other parts of the state. Friends and foes alike know him as big Johnny Moss because of his 6 foot, 4-inch, 300-pound frame, which he squeezes in and out of his car. Big John, who turned 42 on June 10, is a heavy equipment operator. 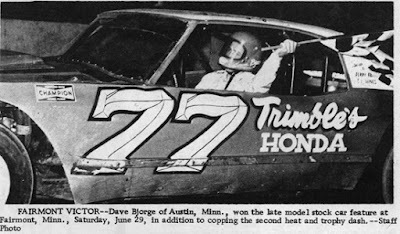 His racing career started in 1956 when he started building stock car engines and became the co-owner of a car with Bob Gingerich of Iowa City. Moss has had more than his share of mechanical problems with his car this year and currently is in 13th place in the late model division point standings with 770 points. For success, he's possibly done his best on the Iowa State Fairgrounds track in Des Moines; but he still likes the West Liberty track even though it's narrow in spots. “Racing here (at West Liberty) is like coming home,” he says. Besides lots of changes among the drivers he competes against, Moss has seen many changes from the days when the Mississippi Valley Speed Club sponsored jalopy races at the West Liberty, Columbus Junction .and Mount Pleasant tracks. 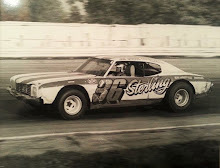 It takes much more money to build a late model stock car and John says “We've got as much money invested in tires now as we used to have in those old jalopies.” Over $25,000 is invested in three engines. One change Moss doesn't like in the rules changes made by Super Stocks, Inc., which sanctions the races now, is that the competition is lined up, according to the point standings. Drivers, used to compete in time trials for positions, but with his car problems this year his place in the point standings haven't given him any advantageous starting spots. “I'll take time trials any day,” he says. 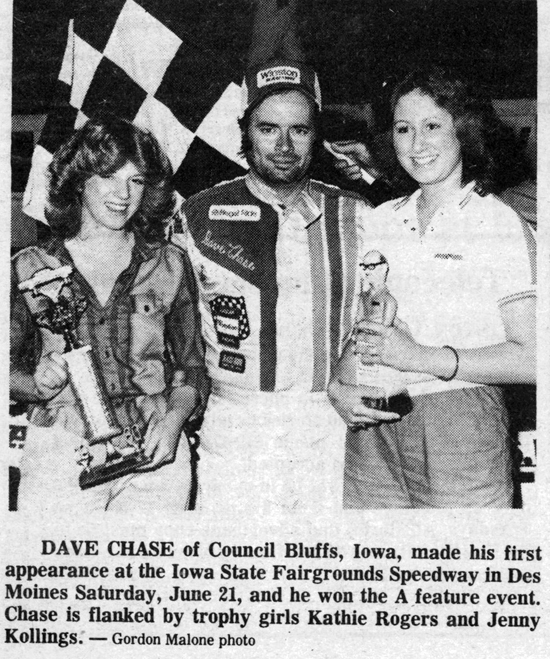 Des Moines, Iowa (June 19, 1976) - Bill Davis won his second straight sportsman feature and defending late model point champion Don Hoffman finally got one under his belt Saturday night in the stock car races at the State Fairgrounds. Davis of Des Moines led all but one lap of the 14-lap feature, shortened one circuit because of a spin by point leader Rick Merryfield in the first turn of the fifteenth and final lap. Merryfield was awarded fourth place. Larry Embrey of Grimes challenged Davis the entire race, leading the fourth lap, but eventually finished second with Dave Farren of Des Moines third. 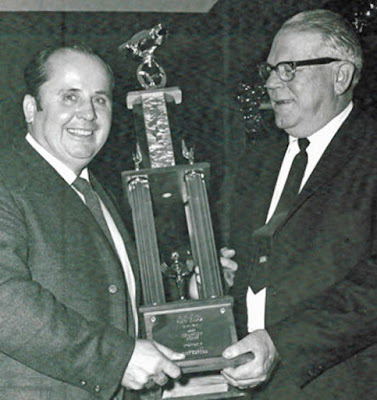 Merryfield’s spin proved beneficial to Davis, whose 1970 Camaro’s radiator was boiling over as he received the first-place trophy to the cheers of the 8,425 fans. 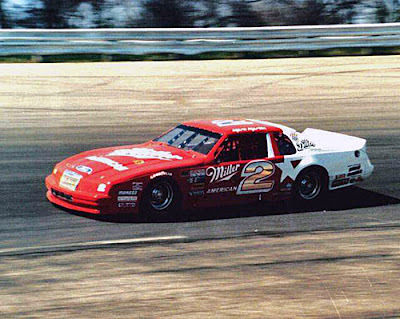 The final restart was the result of Jerry Campbell’s collision with the front straightaway wall when he tried to pass Farren. “I guess there just wasn’t enough room to pass,” said Campbell of the accident which badly damaged the front end of his 1970 Camaro. Davis has had little success in his new Camaro this season but that has changed the last few weeks. Hoffman is another driver with a new car, and he’s also made several changes on his 1970 Pizza Hut Nova before finding the winning combination for the first time this season at the Fairgrounds’ one-half-mile dirt oval. Hoffman’s crew apparently has found a near-perfect setup because he led all 25 laps and had a full straightaway lead at the finish ahead of second-place George Barton of Ankeny. Ken Davidson of Indianola was third, followed by Dave Chase of Council Bluffs and Karl Sanger of Waterloo. It was Hoffman’s fourth feature victory this year and second this week - he won at Oskaloosa Wednesday night. The feature and first heat victories were worth $610 to the Des Moines driver. It took six restarts before the sportsman 12-lap consolation race got underway. Half of the 16-car starting field was eliminated by spins and collisions in the dry, slick turns. But Rex Carter of Adel outlasted them all to take the victory with Cal Swanson of Reinbeck second and Steve Osborn of Des Moines third. The 6-lap late-model consolation went to Lefty Robinson, who was followed by Jim Wilson and Fred Knapp, all of Des Moines.